Buy a magic mushroom grow kit for a reduced price. Growing mushrooms is easy! Estimating what our valued customers will purchase is less straightforward. Sometimes random strains will get close to their maximum shelf life but will still produce plenty magic mushrooms. We do not like to throw out good grow kits, therefore we offer them for a reduced price before they expire. Order today and receive a random cubensis magic mushroom growkit. Get yourself a good deal on these grow kits. The best before date is getting close and we do not want to waste them and throw them away when the time comes. 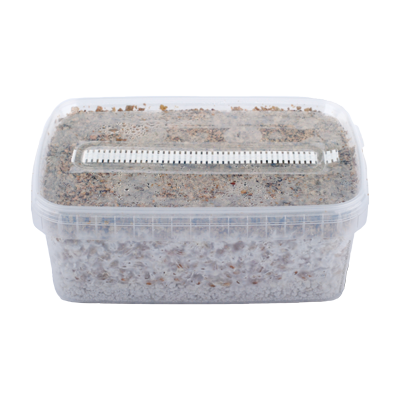 All our mycelium grow kits are ordered from professional suppliers that produce the growkits freshly on our behalf. Shipment to us is overnight in specialized cooled transport and within two hours after we have recieved the kits, the grow kits are labeled and stored in our industrial sized cooled climate rooms. Why are these kits so low in price, is something wrong with them? No nothing is wrong with these kits. They are just getting close to their best before date. How does Magic Mushrooms Shop know the best before date? When we receive the grow kits from our supplier, Magic Mushrooms Shop labels the grow kits with the weeknumber from that week. The best before date from our grow kits is 6 weeks after this weeknumber. The cultivation process from our grow kits should be started within these 6 weeks. How do I know the best before date? The grow kits have stickers on the box. The sticker with two numbers shows the weeknumber Magic Mushrooms Shop has received this kit. Which grow kit will I receive? We will send you the grow kit that has been in our storage longer than others. We will choose one for you so... surprise suprise! There is another sticker on the box that indicates which strain you have received. Can I store the short dated magic mushroom grow kit in the fridge to grow it later? No. Start right away. If you have it shipped to a different address, parcel point or postoffice, pick it up immediately so you can start growing. Don't wait for days, that is the whole thing with short dated stock: there is not much time left to start! Which growing instructions should I follow?